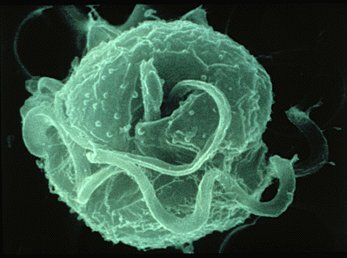 Pfiesteria is a dinoflagellate organism that is responsible for massive algal blooms and fish kills. It has a complicated life cycle and a number of life stages. In certain stages, Pfiesteria can produce a toxin that is harmful to fish and can even have an effect on people. Unlike other algae-bloom-causing dinoflagellates, Pfiesteria does not cause discoloration of the water. They have flagellated tails that they use to move about. In the presence of fish, Pfiesteria transforms from an inactive cyst to a cyst that produces poison. When the poison kills the fish, the Pfiesteria feeds off its victim. Pfiesteria were first found in North Carolina and can be found as far south as the Gulf of Mexico and as far north as the Delaware Bay in brackish water ecosystems. Fish kills resulting from Pfiesteria can have a negative effect on the fishing industry. Populations and locations of Pfiesteria are being monitored and tracked closely by various state governments and laboratories. "Pfiesteria". Virginia Department of Health. Retrieved from: http://www.vdh.virginia.gov/epidemiology/DEE/HABS/Pfiesteria/.